We love the Science Museum and have bought toys and other gifts from its shop in the past so, when we heard about the new store, we decided to pass a rainy afternoon going along to Bluewater to have a look. On first impressions the unit occupied by the shop was quite busy with shoppers and it took us a couple of minutes to negotiate our way through the front section with the buggy. Once through we discovered that there is a demonstration station at the rear of the store where there are live experiments at certain times through the day (it was a week day) – we were told that they take place all day at the weekend and other busy times. Unfortunately, we had just missed a session (on Forces) and the next one was advertised for much later in the day. Happily, the friendly demonstrator was kind enough to give MJ his own one-to-one session, showing how you can make a rocket out of everyday household products and setting one off much to MJ’s amazement (we will definitely be trying that one again at home). He also did the old trick of pulling away a table cloth from under a teapot and mugs and would probably have continued the show had MJ’s attention not been drawn away to see “his super powers shoot out of his fingers” by touching a Plasma Ball (which, in case you were wondering, looks like this). There were also gadgets to play with and remote control games to try. 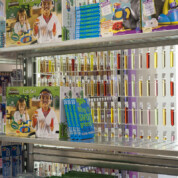 The products cover all age ranges from cute astronaut-themed toddler backpacks, T-shirts and umbrellas to the aforementioned Plasma Ball and quirky adult gifts such as science lab-inspired tableware. The Science Museum kindly gave MJ a goody bag with some space-related gifts as a thank you for our visit.